No pictures found for plate number BDZ063 in Minnesota, United States. click here to add a picture. No videos found for plate number BDZ063 in Minnesota, United States. click here to add a video. 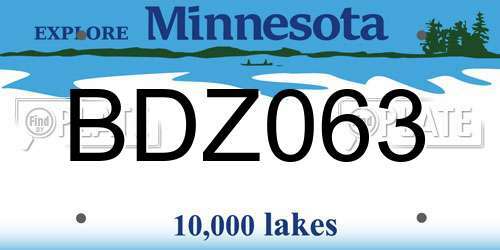 No owners found for plate number BDZ063 in Minnesota, United States. click here to add an owner. No related websites found for plate number BDZ063 in Minnesota, United States. click here to add a related website. FORD WILL PROVIDE ADDITIONAL WARRANTY COVERAGE FOR THE HEATER BLOWER SWITCH FOR 10 YEARS FROM ORIGINAL DATE OF SALE OF THE VEHICLE OR 150,000 MILES, WHICHEVER COMES FIRST. DEALERS WILL INSTALL A NEW HEATER BLOWER RESISTOR AND A NEW WIRE JUMPER HARNESS FREE OF CHARGE. DEALERS WILL INSTALL A POSITIVE TEMPERATURE COEFFICIENT DEVICE IN-LINE WITH EACH FAN MOTOR. FORD WILL ALSO EXTEND THE WARRANTY ON THE ENGINE COOLING FAN ASSEMBLY TO A TOTAL OF 8 YEARS OF SERVICE OR 100,000 MILES FROM THE WARRANTY START DATE, WHICHEVER OCCURS FIRST. IF THE VEHICLE ALREADY HAS MORE THAN 100,000 MILES, THIS COVERAGE WILL LAST UNTIL JULY 31, 2001. OWNER NOTIFICATION BEGAN FEBRUARY 5, 2001. OWNERS WHO TAKE THEIR VEHICLES TO AN AUTHORIZED DEALER ON AN AGREED UPON SERVICE DATE AND DO NOT RECEIVE THE FREE REMEDY WITHIN A REASONABLE TIME SHOULD CONTACT FORD AT 1-800-392-3673. ALSO CONTACT THE NATIONAL HIGHWAY TRAFFIC SAFETY ADMINISTRATION'S AUTO SAFETY HOTLINE AT 1-888-DASH-2-DOT (1-888-327-4236). VEHICLE DESCRIPTION: PASSENGER VEHICLES. THE FLOOR SHIFT AUTOMATIC TRANSMISSION CONTROL CAN BE DAMAGED IF SUBJECTED TO CERTAIN INTERIOR CLEANING PRODUCTS. THE GEAR POSITION INDICATOR CAN DETERIORATE AND NOT CORRECTLY INDICATE THE ACTUAL GEAR POSITION. THIS CONDITION CAN RESULT IN INCORRECT GEAR SELECTION. DEALERS WILL REPLACE THE AUTOMATIC TRANSMISSION FLOOR SHIFT CONTROL. OWNER NOTIFICATION BEGAN NOVEMBER 20, 1998.OWNERS WHO TAKE THEIR VEHICLES TO AN AUTHORIZED DEALER ON AN AGREED UPON SERVICE DATE AND DO NOT RECEIVE THE FREE REMEDY WITHIN A REASONABLE TIME SHOULD CONTACT FORD AT 1-800-392-3673.ALSO CONTACT THE NATIONAL HIGHWAY TRAFFIC SAFETY ADMINISTRATION'S AUTO SAFETY HOTLINE AT 1-888-DASH-2-DOT (1-888-327-4236). VEHICLE DESCRIPTION: PASSENGER VEHICLES EQUIPPED WITH THE TRACTION CONTROL OPTION. THE THROTTLE CABLES WERE DAMAGED DURING VEHICLE ASSEMBLY LEADING TO FRAYING OR SEPARATION OF THE THROTTLE CABLE. THIS CONDITION COULD PREVENT THE ENGINE FROM RETURNING TO IDLE. DEALERS WILL REPLACE THE THROTTLE CABLE WITH A REVISED DESIGN THAT IS LESS SUSCEPTIBLE TO BENDING OR KINKING DURING INSTALLATION. OWNER NOTIFICATION IS EXPECTED TO BEGIN JANUARY 13, 1998. OWNERS WHO TAKE THEIR VEHICLES TO AN AUTHORIZED DEALER ON AN AGREED UPON SERVICE DATE AND DO NOT RECEIVE THE FREE REMEDY WITHIN A REASONABLE TIME SHOULD CONTACT FORD AT 1-800-392-3673.ALSO CONTACT THE NATIONAL HIGHWAY TRAFFIC SAFETY ADMINISTRATION'S AUTO SAFETY HOTLINE AT 1-800-424-9393. CRACKS HAVE BEEN FOUND IN THE FRONT SAFETY BELT OUTBOARD ANCHOR TABS DUE TO A COMBINATION OF HYDROGEN EMBRITTLEMENT OF THE TAB AND STRESS INTRODUCED DURING ATTACHMENT OF THE ANCHOR TAB TO THE SEAT FRAME. THIS DOES NOT CONFORM WITH THE REQUIREMENTS OF FMVSS NO. 210, "SEAT BELT ASSEMBLY ANCHORAGES." CONSEQUENCE OF NON-COMPLIANCE: A FRACTURE OR SEPARATION IN THIS AREA WOULD REDUCE THE LOAD THAT THE ANCHOR AND THE FRONT SAFETY BELT ANCHORAGES COULD SUSTAIN, INCREASING THE RISK OF INJURY IN A VEHICLE COLLISOIN. DEALERS WILL INSPECT AND INSTALL AN ANCHOR TAB REINFORCEMENT OR REPLACEMENT OF THE COMPLETE FRONT SEAT BELT ASSEMBLY IF AN ANCHOR TAB IS FOUND TO HAVE FRACTURED. SYSTEM: INTERIOR; RESTRAINT; BELT ANCHOR AND ATTACHMENT; FMVSS NO. 210.VEHICLE DESCRIPTION: PASSENGER VEHICLES.NOTE: A SMALL NUMBER OF VEHICLES BUILT AT THE CUAUTITLAN, MEXICO ASSEMBLY PLANT FROM SEPTEMBER 4 THROUGH SEPTEMBER 8, 1995, ARE ALSO INCLUDED.NOTE: OWNERS WHO TAKE THEIR VEHICLES TO AN AUTHORIZED DEALER ON AN AGREED UPON SERVICE DATE AND DO NOT RECEIVE THE FREE REMEDY WITHIN A REASONABLE TIME, SHOULD CONTACT FORD AT 1-800-392-3673. ALSO CONTACT THE NATIONAL HIGHWAY TRAFFIC SAFETY ADMINISTRATION'S AUTO SAFETY HOTLINE AT 1-800-424-9393. THE PASSENGER SIDE AIR BAG MAY NOT INFLATE PROPERLY RESULTING IN REDUCED OCCUPANT PROTECTION IN A VEHICLE ACCIDENT. IF THE IGNITER END CAP SEPARATES IN A FRONTAL COLLISION, HOT GASES CAN BE RELEASED AND IGNITE FLAMMABLE MATERIAL OR CAUSE BURN INJURIES. SYSTEM: INTERIOR; PASSIVE RESTRAINTS; AIR BAG; PASSENGER. VEHICLE DESCRIPTION: PASSENGER SIDE AIR BAG IN PASSENGER CARS, VANS ANDMULTI-PURPOSE VEHICLES. NOTE: IF YOUR VEHICLE IS PRESENTED TO AN AUTHORIZED DEALER ON AN AGREED UPON SERVICE DATE AND THE REMEDY IS NOT PROVIDED FREE OF CHARGE WITHIN A REASONABLE TIME, CONTACT FORD AT 1-800-392-3673. ALSO CONTACT THE NATIONAL HIGHWAY TRAFFIC SAFETY ADMINISTRATION'S AUTO SAFETY HOTLINE AT 1-800-424-9393. THE GLASS TEMPERING PROCESS ON THE RIGHT HAND REAR DOOR WINDOWS WAS NOT CORRECTLY PERFORMED. THIS DOES NOT MEET THE REQUIREMENTS OF FMVSS NO. 205, "GLAZING MATERIALS." CONSEQUENCE OF NON-COMPLIANCE: IF THE WINDOW BREAKS, THE GLASS FRAGMENTS OF THE REAR WINDOWS EXCEED THE SIZE SPECIFICATIONS OF FMVSS NO. 205. DEALERS WILL REPLACE THE RIGHT REAR DOOR GLASS. SYSTEM: VISUAL SYSTEMS; GLASS; WINDOW; DOOR AND SIDE.VEHICLE DESCRIPTION: PASSENGER VEHICLES. NOTE: IF THE VEHICLE IS PRESENTED TO AN AUTHORIZED DEALER ON AN AGREED UPON SERVICE DATE AND THE REMEDY IS NOT PROVIDED FREE OF CHARGE WITHIN A REASONABLE TIME, PLEASE CONTACT FORD AT 1-800-392-3673. ALSO CONTACT THE NATIONAL HIGHWAY TRAFFIC SAFETY ADMINISTRATION'S AUTO SAFETY HOTLINE AT 1-800-424-9393. A METAL SHIELD ON THE OUTSIDE OF THE PLASTIC FUEL FILLER PIPE CAN DEVELOP A STATIC ELECTRICAL CHARGE DURING REFUELING OF THE VEHICLE. A STATIC CHARGE CAN DISCHARGE AND SERVE AS AN IGNITION SOURCE FOR FUEL VAPORS IN THE AREA OF THE FILLER PIPE, RESULTING IN A FLASH VAPOR IGNITION AND A VEHICLE FIRE. DEALERS WILL INSPECT AND, IF NECESSARY, MODIFY THE VEHICLES BY ADDING A GROUND STRAP BETWEEN THE FILLER PIPE SHIELD AND THE BODY. SYSTEM: FUEL; FUEL TANK ASSEMBLY; PIPE; FILLER; NECK.VEHICLE DESCRIPTION: PASSENGER VEHICLES.NOTE: IF THE VEHICLE IS PRESENTED TO AN AUTHORIZED DEALER ON AN AGREED UPON SERVICE DATE AND THE REMEDY IS NOT PROVIDED FREE OF CHARGE WITHIN A REASONABLE TIME OR THE REMEDY DOES NOT CORRECT THE DEFECT OR NONCOMPLIANCE, PLEASE CONTACT FORD AT 1-800-392-3673. ALSO, CONTACT THE NATIONAL HIGHWAY TRAFFIC SAFETY ADMINISTRATION'S AUTO SAFETY HOTLINE AT 1-800-424-9393.